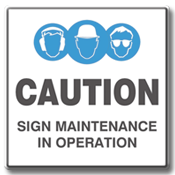 Do your signs look tired and worn, don’t worry Trademark Signs offer a full MAINTENANCE service which include replacing bulbs, starters and gear trays to your illuminated signs, removal and replacement of old vinyl lettering, revamping tired or weathered paintwork and ironmongery and even simpler just a good old clean! No job is too big or small so get in touch and be amazed at what we have to offer you. By choosing Trademark Signs you have made the best choice in securing potential custom for you and your business.